Today I’m going to give a little peak into what goes into a sweater design. Today’s exploration is the Diverging Paths Pullover in the Winter 2015 Creative Knitting Magazine. Sometimes I start with a stitch pattern idea, and other times a silhouette. In the case of Diverging Paths, it was a little of both. I had been wanting to do a comfy relaxed fit reverse shirt tail pullover and I knew I wanted a center cable. 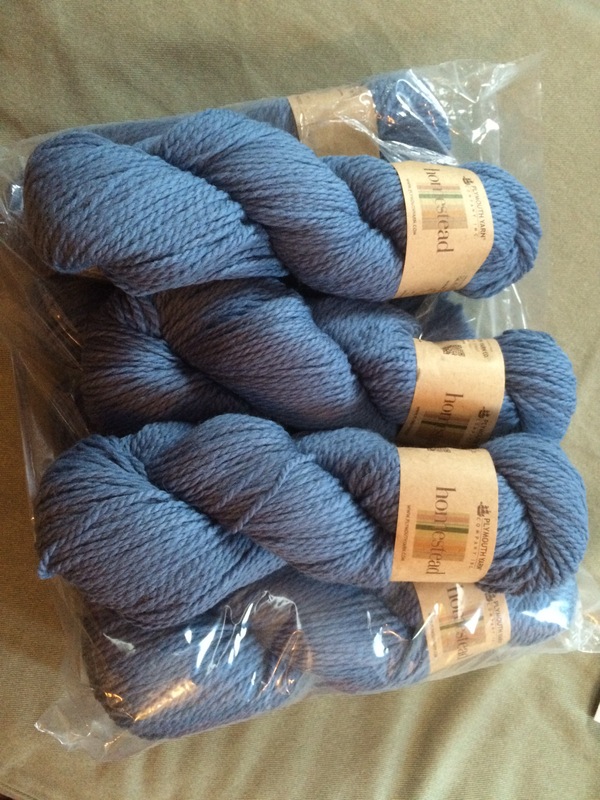 I had the skein of yarn I knew I wanted to use, Plymouth Homestead, so I started swatching. Next step is to be able to communicate your design. Bad news is, I’m not much of a sketcher, but good news is, Kara Gott Warner has a good imagination. In order to make sure the it was clear how large the center panel would be, I scanned the swatches, and overlaid them onto my schematic in Illustrator to show them at scale. Sad wrist, time to cast on. 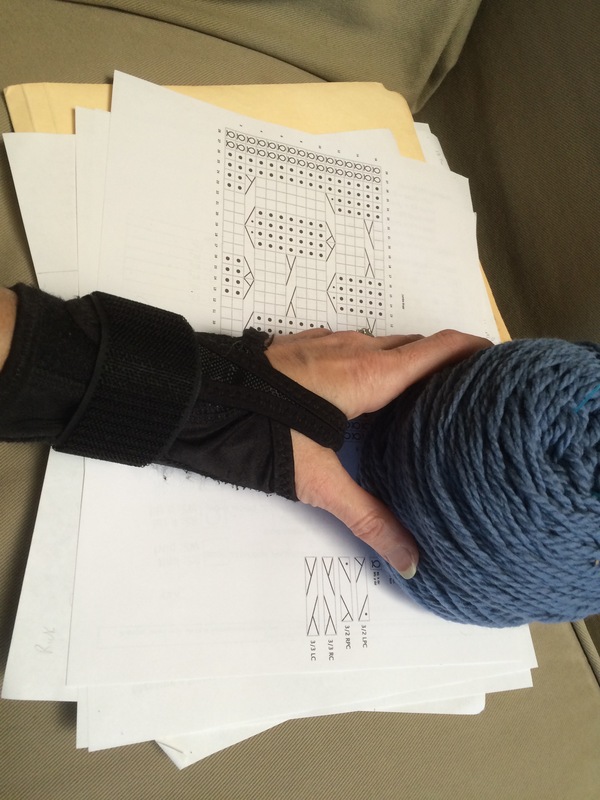 Unfortunately, while waiting for the yummy, yummy yarn to arrive, I had hurt my wrist. I had two other sweaters being knit by sample knitters, so I put on a brace and knitted on. Due to a shipping glitch I got the yarn late, so the nice folks at Creative Knitting gave me an extra week, but just asked if I could send some update pics. So . . . I ended up taking a few. 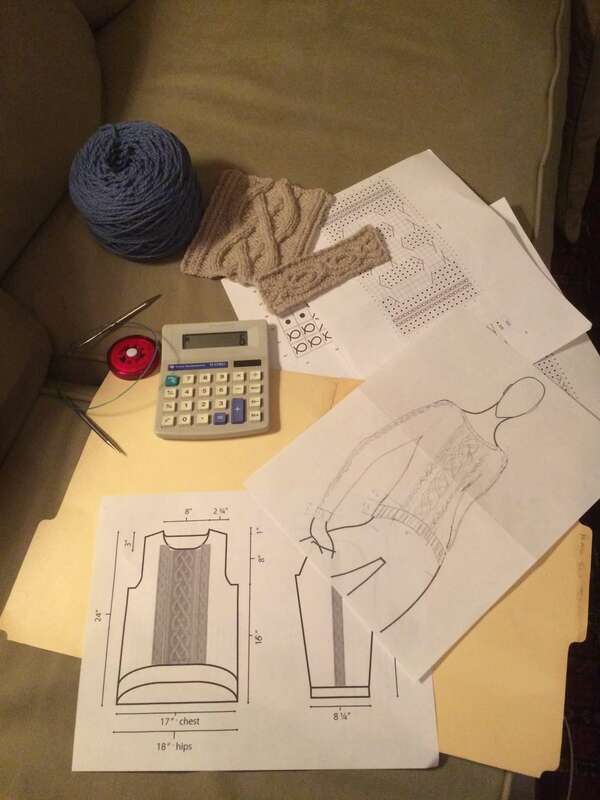 Best (and most timely) thing I have read all day about knitting – dreaming of how one designs a sweater as I am knitting my current one from a pattern, and trust Patty to be a source for inspiration! I love this! I will have to get the magazine. 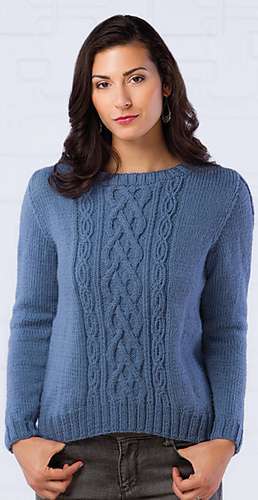 My dilemna now is which sweater is first: Herringbone Cowl or this one!? Thanks Kara. You’re the best! I love this design, with one small difference. I am not a thin person, so I plan to adapt the front to be straight across at the bottom. I hope you do not mind. This design is teaching me some new techniques. Chicken that I am, I started with a sleeve to be sure I could do the twisted rib, and I’m happy to report that it is working out well. Thanks SO much for the video on the stretchy cast-on method!! Of course I don’t mind. However, the reverse shirt tail shape is great for creating the illusion of a slimmer line because it covers up the bum in the back and makes our legs look longer. Just play around with the length so that the shortest part of the shirt tail covers what you want to cover and it will look great.